EA's Grand Slam Tennis is one of the first games to make use of Nintendo's new Wii MotionPlus controller tech. And it utterly rules! Nintendo's latest controller technology for the Wii is going to completely revolutionise motion controlled gaming when it releases later this spring, TechRadar can confidently report, as we just spent some precious time at EA's UK headquarters in Guildford playing an early build of the publishers' forthcoming tennis title, Grand Slam Tennis. That's right folks! TechRadar has finally had the opportunity to get a brief hands-on with Nintendo's latest controller technology for the Wii, and can thankfully report that the Wii MotionPlus experience finally delivers on the promise made by Satoru Iwata when he first unveiled the Wii's motion-tracking controller at the Tokyo Game Show back in September 2005. Playing a tennis game with Wii MotionPlus after playing the same game without the new, improved controller is the equivalent of taking the stabilisers off of your first bike. It is taking your first baby steps into a world in which gaming is going to be a whole lot more fun than ever before. It's like going from VHS straight to Blu-ray. Put as simply as possible, Nintendo's Wii MotionPlus – from our brief playtest with EA's Grand Slam Tennis - virtually recreates the feeling of swinging a real tennis racquet and translates this onto the screen in the most accurate way to date. Not since we played Rockstar's sublime Rockstar Games Presents Table Tennis way back in the summer of 2006 have we been so utterly captivated and charmed by an apparently simple (yet secretly hugely in-depth and highly addictive) game of virtual bat and ball. TechRadar will be bringing you our detailed first impressions and interviews with EA Sports' developers marketing guys behind the title the second our embargo is lifted later this month/early next month. Right now though we can promise you one thing. Sega's Virtua Tennis just got its first serious competition in, well, for ever. EA's Grand Slam Tennis is to that game what FIFA is to Pro Evolution Soccer. On which note, TechRadar will be putting the Wii Version of Sega's mighty Virtua Tennis through its paces in the coming weeks. 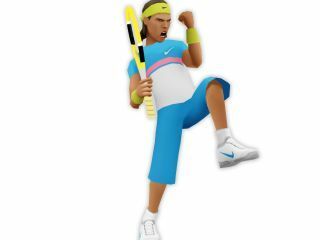 EA Sports' Grand Slam Tennis releases on 19 June. Just in time for Wimbledon. Strawberries and cream, anyone?